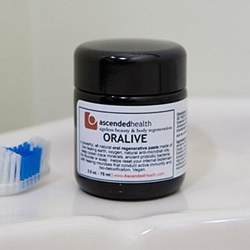 Oralive Regenerative Dental Elixir is powerful, all-natural oral regenerative paste made of live healing earth, oxygen, natural anti-microbial oils, deep ocean trace minerals, and ancient probiotic bacteria, with no fluoride or soap. Helps reset your internal bioterrain with healing microbes that conduct active immunity and bio-detoxification. Vegan. This Oralive elixir is a cutting-edge tooth and gum paste that has been designed for maximum energetic and physiological oral health! This elixir will have a strong and slightly sweet mint taste with undertones of mixed herbs. Please note that the paste has a mixture of clays, calcium, and magnetic healing earth, and therefore may be slightly gritty. This nutritional energy elixir is made to help your body detoxify and heal itself naturally. Taken orally, the natural botanical ingredients are absorbed through the gum mucosa--a much more direct way of entering your bloodstream. When you place a small dab on your tongue and swish it through your teeth, your saliva naturally activates many of the enzymes and unleashes a torrent of regenerative energetic healing vibrations in your mouth. Many Ascended Health clients prefer to use this as a replacement for their toothpaste. However, please note that this is purely intended as an energetically enhanced nutritional supplement absorbed through your gums. It is actually a combination of expensive nutritional supplements all rolled into one. They synergistically enhance each other to help your body detoxify and heal itself. To start with, this elixir is a living paste filled with enzymes, minerals, and probiotics in the raw, natural state. There is nothing synthetic or artificial here, and everything put in it has been harvested ethically and sustainably. Since Ascended Health's focus is on energetic healing, they pay close attention to the vibrations of how things are grown, collected, processed, and packaged. Any energies connected with harsh chemical processing or harvesting would carry onto the remedies. The mixture of natural high-energy mineral earths, activated herbal extracts, oxygen, and marine phytoplankton make the elixir a healthy, charcoal earth tone. It is sweet and minty--quite delicious. Secondly, this raw organic elixir is meant to be swallowed after you absorb the initial nutrients through your gum mucosa. Ascended Health considers this a natural supplement that helps your body heal and stay healthy. They pack it full of powerful herbal essential oils and tissue regeneration factors not generally found in any product. The benefits of super green botanicals and marine phytoplankton alone are enough to use this as a dietary supplement. If you want to save yourself thousands of dollars in dental procedures (and lots of pain), then use this oral elixir. It is worth it. Ascended Health reports several stories of people cancelling their root canals (due to bacterial infection) by just using this elixir for about 5 days. Listed are benefits Ascended Health has found through experience and testimonials. Whitens teeth - This elixir has powerful concentrated oxygen designed to kill the pain-causing anaerobic bacteria hiding under your gum line. Inhibits bacteria that cause cavities, plaque, and gingivitis - This product contains powerful anti-microbial essential oils, proven scientifically to kill bacteria in clinical studies (e.g., oregano oil and neem). Alleviates gum pain and gum bleeding - This elixir is designed to kill the cause of gum pain: infection, caused by bacteria and other microbes. It takes about 5-7 days to kill off enough of the populations to start deadening the pain. If you have mouth pain, use this toothpaste and swish it hard between your teeth for five minutes. This is designed to kill the pain. If you have severe, unrelenting gum and teeth pain, check out the extra-strength elixir. Eliminates bad breath - The taste of this elixir is fantastic--it has a lot of incredible minty energy that just explodes in your mouth. You can use it as a mouthwash during the day, just by swishing between your teeth and swallowing. The volcanic earth absorbs bad odors, even garlic. Volcanic Earth Minerals, Vitamin C, Camu Camu, Amla, Calcium, Xylitol, Nettle, Folic Acid, CoQ 10, Marine Phytoplankton, Astaxanthin, Blue Green Algae, Pau D'Arco, Aloe Vera, Noni, Peppermint, Melissa, Arnica, Licorice, Mint, Turmeric, Holy Basil, Ginger. Essential Oils of Neroli, Jasmine, Spikenard, Rose. **Because of all the plant botanicals, this paste is quite green and naturally high in pH. Feel free to use this product like a regular toothpaste! However, please also note that in order to achieve the maximum possible benefits from its ingredients you will require sufficient exposure time. Keep in mind that everyone's conditions and bodies are different and you may need more time to instigate the health process. For minor conditions and everyday use brush and swish approximately one large pea-sized dab on your toothbrush (brush gently) 1-3 times per day. Also feel free to swish the product for as long as you want (5-20 minutes recommended). Upon completion you can swallow the paste if you feel comfortable or spit into the sink. If you don't mind the green spots you can keep the product on your teeth for as long as you want before rinsing with water! High amounts of oxygenated chlorophyll may discolor toothbrush but not teeth. Crunchiness due to safe micronutrient trace minerals.